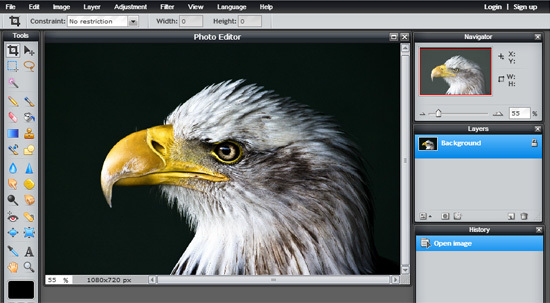 Edit photos online quickly and easily by using the application of online photo editor by Pixlr. The followings are the easy steps to use an Online Pixlr Editor. 2. Choose the photo that will be edited (the photo can be taken directly, through a personal computer, URL photos from other media such as Facebook, Twitter and others). 3. After a photo is chosen, enter the page of the photo editing panel. Use the navigation button to zoom in and zoom out the photo. Use Layers to make, choose, edit and reorganized the background ofthe photo. Changes made in the photo (adding text, applying filters or adding another picture) will automatically appear on the background layer of the original photo in order to make editing control easier. The History panel is working to keep everything applied in the photo. Just click on that particular part if undo or redo necessary to be done. 4. Using the Chosen Button to cut a picture. Lasso to choose a freehand option on the piece of the picture.